More than ever in today’s classrooms technology integration is redefining the learning process. Digital tools can be incorporated in a variety of ways- from games, online textbooks, videos, apps, web 2.0 tools, learning management systems (like Converge☺ )…the list goes on and on. But the end result is evident: digital learning has become an essential part of the educational experience. Schools are currently experiencing a huge culture shift. As many districts, schools, administrators and teachers integrate technology into their instruction, the digital revolution has also left MANY behind. Going digital requires much more than simply putting devices in the hands of students. The factors to consider can range from technology infrastructure and funding to teacher training and student policies just to name a few. And on top of that, let’s remember the fact that technology is constantly changing at lightning speed. How do you keep up? Where do you begin? How do you continue to move forward? 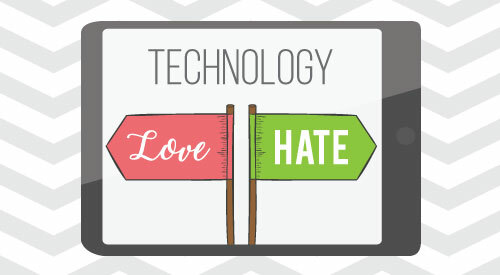 This quickly creates the “Love-Hate Relationship” with technology that many educators share. When it does work, it’s fantastic! There’s increased engagement, enthusiasm, and your students are excited about the lesson. But no matter how prepared you are there will be technical difficulties to navigate. Problems will arise: the wireless connection is down, apps won’t download, websites are blocked, which, in turn, forces you to resort to plan B on the fly (assuming you even have a plan B -ha). In my three years as a Technology Integration Specialist I’ve learned that sometimes you just have to let it go, try something new, embrace the failures, and simply learn from the experience. Technology is an important part of today’s instruction, but it’s NOT all about the tech; it’s about you, the teacher! Technology works because of how you creatively incorporate it into instruction. Devices do not change a classroom; an inspiring, fearless, innovative educator does! Technology will NEVER replace you. Instead it gives you the ability to support, enhance, and transform instruction by creating new experiences for students inside and outside of the classroom. In the end, the benefits of technology integration far outweigh the difficulties. Start Small: Technology moves quickly- and there are thousands of resources to choose from. Focus on one thing at a time- and USE it. Get comfortable with that tool and incorporate it into your classroom instruction. Then when you’re ready, try a new tool. This will help you focus on incorporating the content into the technology and create a foundation that you can build from. It’s better to use three tools well and often, rather than ten tools sporadically. Choose Tech Tools That Support Creation and Redefine Instruction: Technology is not meant to be substituted for what can be accomplished with paper and pencil. Choose tools that can extend the learning and allow students to further explain and explore the content in a new way. Student choice and creation is key in the learning process. Give them freedom to choose their own direction. Further Your Learning: Stay up to date on tools that are available to you. Create a professional Twitter account and connect with fellow #EdTech Leaders (like… @Edvergent or @McKnightBridget) Twitter is the best professional development platform for educators- explore the countless resources that are right at your fingertips. Attend an #EdTech Conference. Ask your district to help support your technology goals by attending Professional Developments outside your district. KY teachers, I recommend the KySTE Conference in March- it’s a great opportunity! Ask Your Students: Hear me out here… your students just may be the best support you have. Remember: YOU DO NOT have to master the tools. Create an environment where students are part of the technology experience. They will master these tools MUCH faster than we will…remember they haven’t lived a DAY where they haven’t been surrounded by technology. In the end, we are all learning together. Technology is a journey. It will not be mastered in one day, one week, or even one year. We will continue learning and exploring each and every day. Embrace it, because like it or not, it’s here to stay.